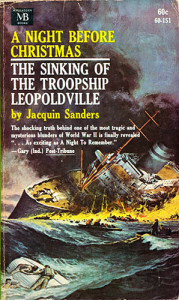 “A NIGHT BEFORE CHRISTMAS” The Sinking of the Troopship Leopoldville. By Jacquin Sanders. The SS Leopoldville was a 11,000-ton passenger line, converted into a troopship for World War II. On Christmas Eve, December 24, 1944, the ship was torpedoed and sunk by the German U-boat, U-486. Over 800 lives were lost, including 763 soldiers. The Leaopoldville sinking is the second greatest loss of life in a single incident after the loss of the American battleship USS Arizona (BB-39) at Pearl Harbor in 1941. At the time of her sinking the troop ship was just 5 miles off the coast of Cherbourg, France. Author Jacquin Sanders tells the shocking truth behind the most tragic and mysterious blunders of World War II. The facts about this sinking were not released until 1961. Here you will learn about the bravery and heroism of a few great men who tried to save their comrades. 1964 Paperback edition., 224 pages, no photos, maps or index.